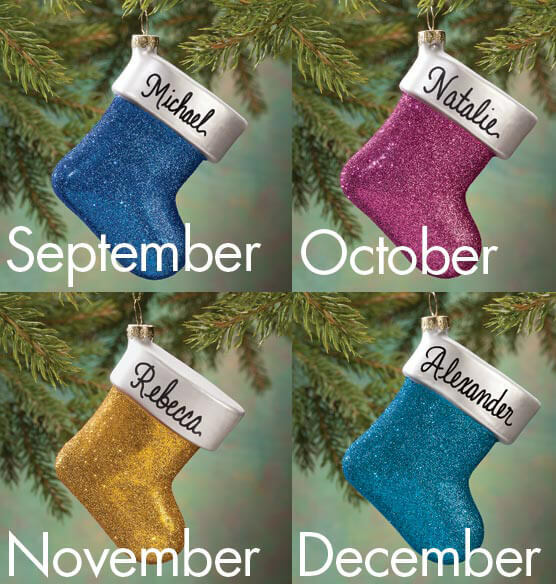 Sparkling in your choice of 12 birthstone colors, this personalized Birthstone Stocking ornament will really ROCK ... personalized for twice the fun! All 12 shimmery jewel tones give our 3D glass ornament exceptional brilliance from every angle. 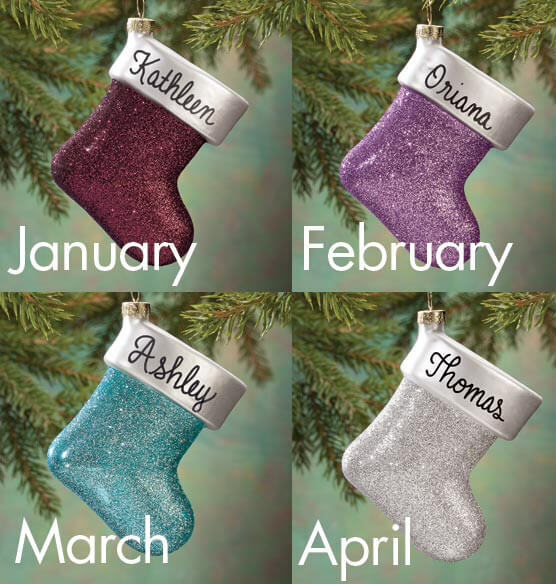 Simply choose month and name so our elves can work the magic ... giving you credit for a custom keepsake gift. Specify month. Specify name; limit 1 line 10 letters/spaces. Christmas ornament measures 4" long x 3" wide. 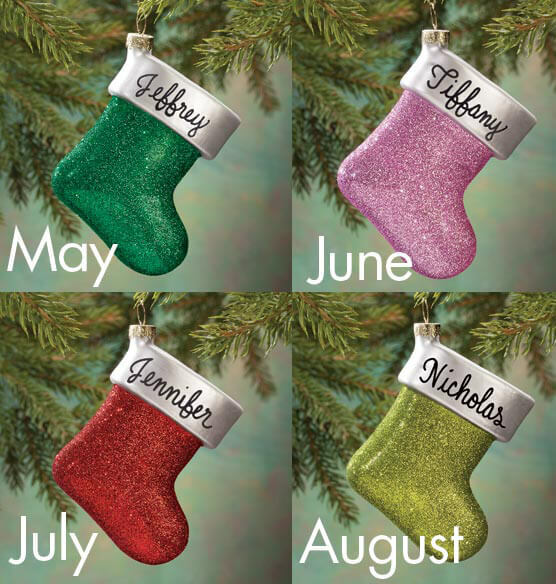 I bought four personalized oraments for my grandson that was born in November . All had spelled his name correctly except for this orament ( I spelled it correctly ) when I called miles kimball they said they sold out of them and would refund my credit card. I believe I bought it on sale and got free shipping . I was looking on line and I ended up buying it again a couple of days later . Funny it was in stock. I was not happy that the customer service rep would not take the time to make their mistake right.. Not only did I have to pay full price but I had to pay for shipping to. I don't usually do reviews but I had to this time. I bought twelve of these, one for each of my kids and grandkids, I was more than pleased, they are beautiful and add such a personal touch to my tree!!???? Great size, beautiful colors and does not seem to excessively shed. would have liked the year on it... i wrote year on other side.. 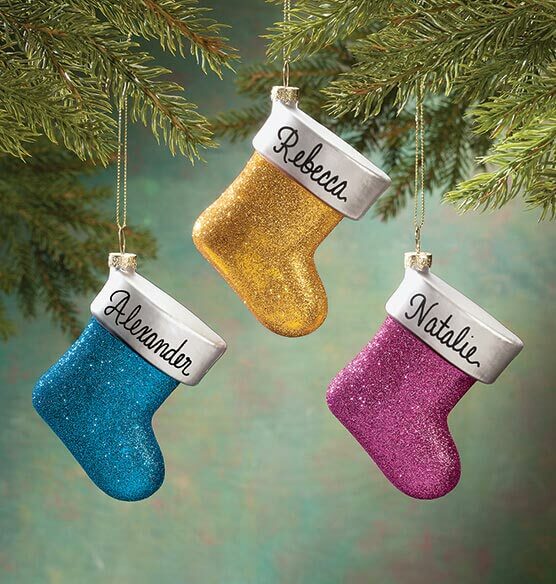 Cute and my daughters love glitter! I have these for my family and my DIL saw them and like them so I ordered them for her family. CAN I ALSO ADD THE YEAR TO THE BACK SIDE? BEST ANSWER: Thank you for your question. We do not put personalization on the back of this ornament. We hope this information will be of help to you.